:God's Word is the strongest weapon in a believer's spiritual artillery. Quin Sherrer and Ruthanne Garlock, bestselling authors of A Woman's Guide to Spiritual Warfare, believe that when Christians use the Bible in intercession and warfare, they bind the power of the evil one and declare God's promises and victory for their lives and for those they love. In The Spiritual Warrior's Prayer Guide, they show the reader how to apply biblical promises to every area of life, whether in illness, financial trouble, depression, concern for wayward loved ones, unemployment, or spiritual confusion. 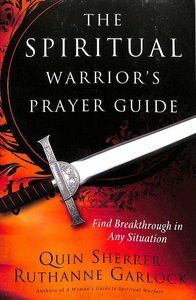 About "The Spiritual Warrior's Prayer Guide: Find Breakthrough in Any Situation"
Quin Sherrer has published 27 books, these include the best-selling How to Pray for Your Children, A Woman's Guide to Spiritual Warfare and most recently Lord, Help Me Break This Habit , she has written for many leading Christian magazines, and received numerous awards. Shes also been a guest on over 300 radio and television shows and is a speaker at weekend retreats for churches, womens groups, and military congregations. Ruthanne Garlock is an author and international Bible teacher living near San Antonio, Texas. Together, she and Quin Sherrer have coauthored 20 books, including their best-sellers, How to Pray for Your Children and A Woman's Guide to Spiritual Warfare. Since her husband's death in 2003, Ruthanne is the only grandparent left for their four grandchildren.